Sreeya Info Tech., is one of the leading Custom Web Application development companies in India. We full- fledged web development center in India. It has required technological infrastructure and modern facilities needed to deliver world class web application development services to global clientele. Our decade-old experience in web development and sound understanding of latest web development platforms empowers us to deliver you classy web solutions that help you leapfrog over your rivals, to earn a distinctive competitive lead. Sreeya Info Tech., offering wholesome user friendly e-commerce development services. Our developers has reputable expertise and proficiency to use various development platforms like Magento, Virtue Mart, X-Cart, osCommerce, etc to provide craft intelligent shopping cart portals, which perfectly suit your online business. Our team is ready to enhance your existing website with custom development and integrate a special e-commerce application to achieve your business needs and for higher productivity. The greatest challenge in the web world is to come up with more interactive and high competitive and high quality developments. Sreeya Info Tech., is offering this world class creative web solutions to all the clients across the globe. Our development team use web technologies like Adobe Flex ,Microsoft Silverlight, AJAX, JQuery to bring sensational graphical effects in your website. Our team also integrates required audio/video clips for your web pages so that your end users have a great interactive feeling with our developed web site. By this your conversion rate increases and assures a better cash flow to your website. Sreeya Info Tech., has extensive expertise in custom mobile application development and our development team has experience in developing user friendly mobile applications across diverse platforms and devices using latest techniques for all major platforms which includes Android, iphone, windows mobile platform. Sreeya Info Tech., offering affordable mobile application development for social networking, online shopping, e-learning, online trading or any other web based application for your mobile phone . There are many sophisticated CMS products out there today, but your site requirements are unique. 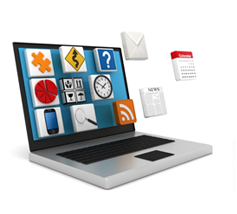 We source the right CMS system for you and then tailor it to meet your needs. Sreeya Into Tech., Content Management System (CMS) gives the power to control your site to the team members responsible for running it. Our solution builds powerful content driven sites and eliminates the need for technical staff. Sreeya Info Tech., offering advanced CMS development platforms like WordPress, Joomla, Drupal, etc to deliver comprehensive CMS applications for your business needs. Mobile gaming industry is booming and to bite deeper into this pie, we at Sreeya Info Tech., fabricate ingenious mobile game applications. We custom develop sensational multiplayer games for your mobile phone so that you can play with other players around the world, online, at click of button.